Clomiphene and Letrozole have caused the UFC huge problems in the past month. In layman’s terms, you take estrogen after you take a cycle of performance enhancers because of side effects. When you cycle, your body is introduced to synthetic testosterone. At this point your body is producing testosterone and androgen levels too far above the norm.. The cycle of naturally produced testosterone is therefore halted. Clomiphene will raises testosterone levels. Basically, the athlete isn’t taking anything that produces additional testosterone, but is manipulating their body into thinking it needs more, so it produces more. Letrozole prevents the side effects of exorbitant amounts of estrogen and leaves more testosterone in the system. Within the past few weeks the UFC has been hit with a PED blackeye. On the eve of the biggest PPV in the history of the sport, Jon “Bones” Jones tested positive for clomiphene (anti-estrogen agent) in addition to Letrozole (aromatase inhibitor). His fued with champion Daniel Cormier has been put on hold again. Jones has been called the best all-round fighter in UFC history, unfortunately he continues to get in his own way. Amid championships and performances for the ages, his continued run ins with the law set him back time after time. It’s unknown how much sponsorship money he’s lost over the years, but after a dust up with his arch nemesis, Cormier a few years back, he lost a deal with Nike worth six figures. Brock Lesnar, arguably the most gifted athlete in UFC history, fought longtime UFC heavyweight Mark Hunt. Lesnar won the fight in typical Lesnar fashion hammering his downed opponent with a hellacious ground and pound that not many people could withstand. After years away from the octagon, Lesnar was again on top of the world, until it was revealed that he failed a pre and post drug tests. Lesnar is a freak of nature. An athlete so awe inspiring and larger than life, it’s almost as if he can accomplish anything. An esteemed collegiate wrestler with an impeccable record, he transitioned that success into an unprecedented run in the WWE where he became the youngest WWE Champion in its history. He left sports entertainment (only to return at a later date) to pursue other interests (NFL), and ultimately began a storied relationship with the UFC where he defeated champion Randy Couture in his fourth professional fight. Rumour has it the Beast won’t face any sort of suspension from this other employer, WWE. TMZ reported that only full time WWE wrestlers are subject to talent and wellness program violations. 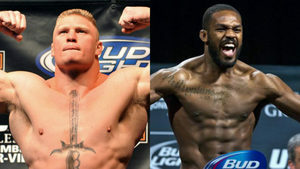 Lesnar and Jones will not be facing any fines from the UFC. Punishment will be handed down directly from the USADA. UFC 200 was altered, more importantly, the legacy of two of the sport’s greatest stars have been tarnished (again) and forever. How could two people, the best at their profession, chance a legacy they worked so hard to build? That’s the eternal question. Most people would do almost anything to be in their shoes. The fame and the fortune…it’s worth it right? I can’t say why any athlete would use performance enhancers, but an educated guess will tell you that it’s a to gain a competitive advantage against your opponent. I can only assume that the will to win is so strong that the consequences will never outweigh the ultimate prize. I’m not an expert in PED’s or steroids, yet it’s very evident that sport in general has upped its game in testing for enhancers. Justin Verlander, longtime pitcher for the Detroit Tigers has been very vocal about his stance on the subject after Miami Marlins, Dee Gordon tested positive for exogenous testosterone and clostebol earlier in the 2016 MLB season. “The players have been pushing for this. We got it to where it is now, and obviously, [if] we still want tougher testing, then both sides would probably want … this game to be clean,” he said. The players want tougher testing and still, people continue to push the envelope. 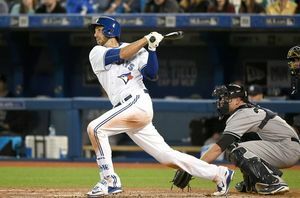 Chris Colabello worked his way up from Independent baseball to become one of the key cogs in the 2015 machine that was the Toronto Blue Jays. Come 2016, Colabello has gone from underdog hero to the guy who got suspended for 80 games and is now ineligible for the 2016 playoffs. Colabello is adamant he didn’t know how ehydrochlormethyltestosterone (DHCMT), an anabolic steroid was found in his system. And he says he will not rest until he has an answer. One one end of the spectrum, you have an elite MMA athletes with nothing left to prove getting caught on the biggest stage of their career. On the other end, you have a guy who has passed umteen drug tests until failing one in the aftermath of a breakout season. Who’s right, who’s wrong? Who’s telling the truth, who’s full of it? There is no way to tell unless you are in the head of that person. Speculation is the only certainty. To put something illegal in your body for a competitive advantage is banned across the board and tarnishes the game. There are those who’ve done it and got away with it and accusations follow some of the biggest names on the planet. When it comes down to it, only that person knows the truth. Was popping that pill or filling that syringe worth it? Was it worth the controversy? Was it worth the dirty looks? I don’t have the answer, but they do.